Loosing a loved one is something that we all know will eventually happen to us. Despite our knowing, there is no way to prepare for such an event. When it arrives, we are usually stricken with a tremendous amount of grief and if we are one of the lucky ones, we’ll have friends and family around to comfort us during this time. Recently, Cynthia of Cynthia’s Fine Yarns and Gifts, had to lay her best friend of 13 years to rest. She was red bull terrier named Zoe. Cynthia’s good friend Christa, intuitively knew that Cynthia was in need of a great big hug, and thus the evening Zoe left us, Chirsta stayed up all night and designed and knitted a big “Hug of Love” neck wrap for Cynthia. Cynthia was so moved by this,that she arranged with Christa to share this fabulous pattern with everyone who is either dealing with grief themselves, or knows of someone else who is. This pattern can be found on Ravelry as a free download, or by clicking on the link here, Hug of Love Pattern. Thank you Cynthia for sharing this story with us, and Christa, for designing such a great neck wrap for a special friend. And I have to add, we are of course very pleased you chose our Schoppel Zauberball Crazy yarn to do so. This pattern was created from the love and compassion of a friend, in my time of grief. I had to put my best friend to sleep on September 15, 2010. She was a beautiful 13 year old red bull terrier named Zoe, a companion for life that I will miss dearly. She had extreme allergies and a poor immune system. I was lucky to have her in my life to help her control her problems as a daily commitment. My friend Christa could feel my loss, having suffered it herself. We had talked only weeks before on creating a pattern using a changing of the needles. When she heard about Zoe, she went to work and in an evening blessed me with the “Hug of Love” pattern. It is written and given in Memory of Zoe. Out of this tragedy in my life came something good to share with others who need a huge hug when deep in their moment of grief. Christa brought a smile to my face and a comfort to me that I didn’t stand alone. I share this pattern with you from Christa and me, Cynthia, to enjoy the process of knitting the hug and carrying our memory of the one we lost with us forever, never ever to be forgotten, and always to wrap our neck as a hug! Go give a knitted hug of love today! 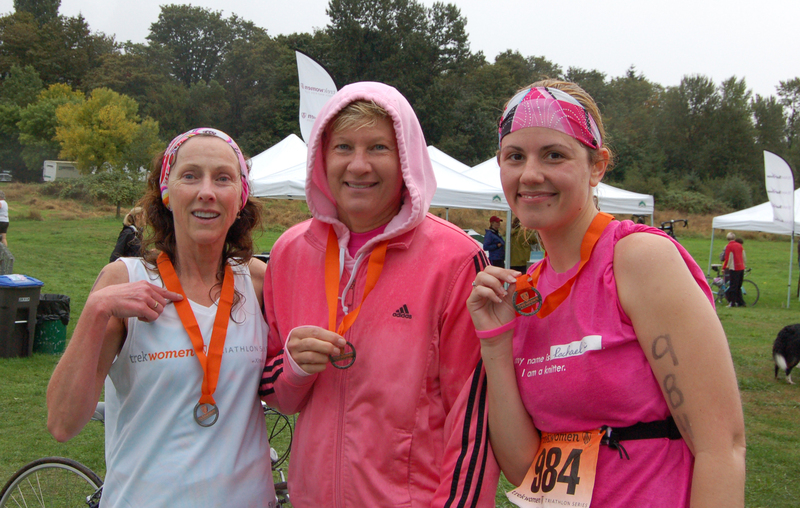 This past weekend three Skacel employees competed in the Trekwomen Triathlon Series: Seattle. Becky Moss (Customer Service Representative), Rachael Hiatt, (Accounts Receivable), and Theresa Skagen, (Accounting) each swam through .45 miles of freezing northwest water, biked through 12.5 miles of hilly Seattle streets, and dashed 3.5 miles to the finish line! These amazing woman were 3 of the 690 who finished, there was a little over a 1,000 registered. 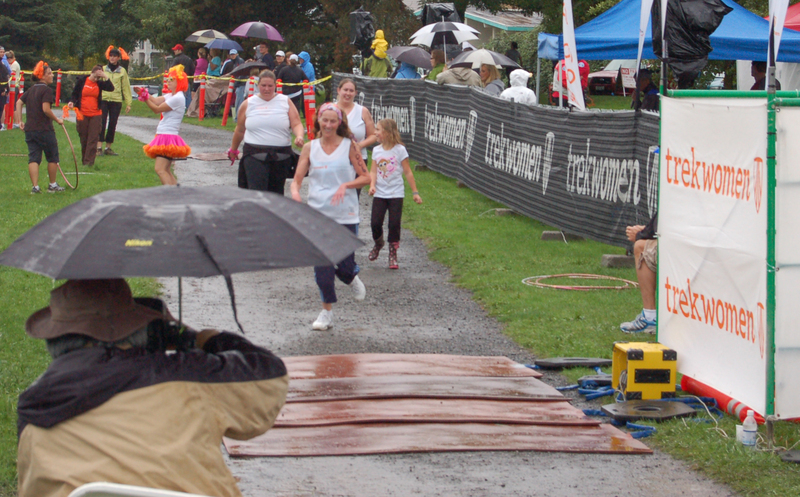 All three participants did an amazing job fighting the weather and fatigue in accomplishing this triathlon. Proud to announce: Addi Swing Hooks! If you enjoy crochet, this is your lucky day! skacel and addi are extremely proud to announce their newest line of crochet hooks, the addi Swing. Developed with comfort in mind, the handle is constructed of two plastics: one colorful and soft, and the other, white and firm. The two balance each other perfectly for just the right amount of flexibility. The handle warms quickly to the temperature of your skin and is precisely contoured to rest comfortably in your hand, thus eliminating pressure points. In fact, the Swing hook feels so good, those who don’t crochet, will want to learn. To top it off (literally), is the classic addi Turbo hook that slides easily in and out of stitches. All the hooks are color coded by size, and the metric size is boldly printed on the handle. No “readers” needed for this one! Hooks are available from a 2mm (A hook) to a 6mm (J hook) and sold individually! Visit your local yarn store and pick some up today!